I love it when nerds come together to do something good. Andrew Slack, founder of the Harry Potter Alliance has turned millions of Potterheads into do-gooders, and now he's turned his eye toward Star Wars fans for Teacher Appreciation Week. It happens to coincide with "May the Fourth," which has become a kind of Star Wars holiday (but not Holiday Special)(thank the Force) for nerds worldwide. His basic idea is to take the passion of fandom and shape it into a force (or Force)(get it?) of good in the world. For Teacher Appreciation Week, he's got the #TeachMeYouDid Challenge. Based on the odd grammar (syntax? 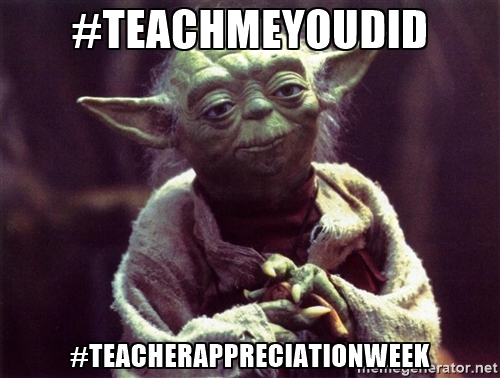 )(kinda talk) of Jedi Master Yoda, it's using the voice and image of Yoda as a master teacher to remind us of all the other teachers who have influenced our lives. Because without a doubt, your life has been influenced by them. 1. Find your own Jedi Master -- Think of someone of taught you, inspired you, awoke the Force within you. 2. Be creative -- Write a note, create a video, draw something, create something to thank them for what they did for you. 3. Spread this online -- Post this to Facebook or Twitter, Tumblr or Instagram or whatever social media you use, and include the hashtag #TeachMeYouDid. 4. Share the love -- If you can, tag your teacher in the post to make sure they see it. 5. Invite them to the Light Side of the Force -- Finally, challenge your friends to join in. If you take up the challenge, let us know what you did, and remember to use the hashtag #TeachMeYouDid. There are some great examples of what people have already done on the #TeachMeYouDid website -- check it out for inspiration and ideas. Graphic Novel Review: "A Wrinkle in Time"